Many job seekers are under the impression that once they leave the interview, their work is done and everything is in the hands of the hiring manager. This is not necessarily true. A well-crafted thank you note can be an effective way of not only showing gratitude but also reinforcing your interest and qualifications for the job. 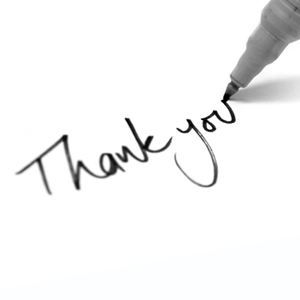 Your thank you note should not be a generic form letter that you send to each employer. It is about much more than just thanking them for their time. You should take the time to personalize each thank you note and make it an extenuation of your interview. It is an ideal opportunity to make yourself stand out a little more and wrap things up on a positive note. Drive home why you are the best fit and can benefit the company. Reiterate your strengths and qualifications. Perhaps after engaging in the interview you were reminded of an accomplishment that really aligns with what the company is looking for. Or maybe you want to reinforce your experience in a specific area. Use your thank you note to highlight these key points one more time and keep them fresh in the interviewer’s mind. You want to make yourself stand out from the competition and bring value that will benefit the company. While the interview is about you, it is also about what you bring to the position and the company as a whole. If you know that you were weak in some areas or maybe fumbled through something in the interview, your thank you note can be used to clarify and reinforce your strengths. Use what you learned. The interview is not just for the company to find out more about you – it also for you to find out more about the company. Pay attention and ask questions. Use what you have learned to further personalize and tailor the content of your thank you note. Make sure you address a thank you to each person you interviewed with and touch on something specific you discussed. Highlight something that appealed to you and furthered your interest in working there or why you would excel in the role. Make it timely. Don’t wait until a few days after the interview to send your thank you note. Whether you are sending an email or handwritten note, do so immediately. This not only shows your gratitude and interest, it demonstrates follow through and attention to detail. In addition, the information will still be fresh in your mind as you personalize things. Before you leave, make sure that you have accurate contact information for the person or people that you interviewed with. Taking the time and effort to send personalized thank you notes can work to your advantage. If the employer was on the fence between two or more equally qualified applicants and you were the only one to send a thank you note, it could give you an edge over the others. Consider your thank you note a necessary part of your application package.